Inspired to NOT take any VC money? 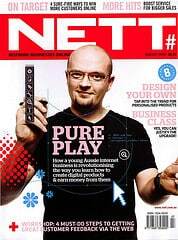 “Our outfit Envato was started by myself, my big brother, my wife and my best friend,” says Collis Ta’eed (pictured below on the cover of Nett magazine). “We put in a bit of money we each had and mostly just worked hard.” In this Q&A, Ta’eed answers questions about Envato and its path to success. https://polymash.com/wp-content/uploads/2018/12/Polymash-Logo-340-300x48.png 0 0 Juergen Berkessel https://polymash.com/wp-content/uploads/2018/12/Polymash-Logo-340-300x48.png Juergen Berkessel2010-10-08 11:41:592014-11-26 18:30:09Inspired to NOT take any VC money? A major gathering of children’s publishers has been urged to stay focused on content despite the increasing familiarity children have with new technological advances. I totally agree with the view that in order to take print content to a digital platform, the wiz bang effects need to add value and enjoyment on the part of the reader, namely children interacting with books on a digital platform. I think the winners in this arena will add interactivity, animation and content in a way that results in a high quality experience. There are other lessons and thoughts for folks looking to publish or re-publish children’s books in this bookseller.com post by Graeme Neill, and an interesting thought from Matt Locke I do not quite agree with, namely that “Facebook may not mean anything in another five years”… Having just seen “the Social Network” I believe Facebook will manage and adjust to stay relevant. Here at Positive Matrix we have been giving a lot of thought to how to get better value out using Twitter in a workshop or conference setting, and we’d like to share some ideas how to optimize not only the technology, but the process and protocol surrounding the use of Twitter in such as setting. Using a Twitter backchannel is nothing new, but seems to be increasing in use. This week alone there were several examples, the “Demo09” conference used a Facebook live video stream with integrated Twitter chat, and this feature became a reference tool for Chris Shipley, who was running the conference and referred to the Twitter streamed comments repeatedly in the conference hall. At the start of the event, most of the messages on the Twitter screen were coming from the room. David Wiley, John Bischke, and Jeff Jarvis where effectively liveblogging the event. It was interesting to see what nuggets they “pulled” from the discussion and shared with the outside world. It is hard to moderate a conversation of 40 people and there are times when several people want to make a point but one gets the opportunity. I started to notice that the others would simply post their thought to twitter instead which allowed the rest of the room to see what they wanted to say in parallel with the point that was being made live. So within an hour of the start of the event, we had a very lively discussion flowing on Twitter. Then I saw people outside of the event start to take notice and send out notes to their followers that the discussion on the #hackedu tag was getting interesting. That brought quite a few new people to the Twitter stream that were not in the room. We have some experience with this, since Positive Matrix is itself a workshop facilitation tool we’ve been using to conduct workshops and conferences for the last 5 years. Positive Matrix allows attendees to participate either directly with wireless keyboards in the room, or remotely via PCs or via linked conference hubs with their own keyboard setup. Although Positive Matrix can be a closed system for registered participants only, like Twitter, everyone is able to see what everyone else is typing on a large projected screen. The speed and gamut of incoming brainstorming ideas and rapid flow of micro-blog thoughts popping up on the screen is made possible through technology, but allowing the group to process these thoughts requires a protocol that introduces opportunity and the space for consideration, clarification, appreciation, understanding, synergy, consensus. Only this allows a group to ultimately convert these ideas into shared knowledge or action points. One way we do this is to adhere to a “talk, type, read, review” protocol for each agenda item. Agenda items are first discussed in round table fashion, and micro-blogging thougts during this time is optional. However, we then create extra time to “write”, and people have the opportunity to contribute their ideas without parallel central conversation going on. Subsequently the “Read” protocol is a step to read (out loud) and review the content and ideas that are on the screen. This step is an essential democratization aspect for those who did not get to make their point during the conversation. It acknowledges everyones feedback and gives the group time for further consideration. We find this process is often the catalyst for more, and better quality ideas. …I think we should have tried to loop the conversation happening outside of the room back into the room. Maybe have one person whose job it is to pull the most interesting tweets coming from outside the room and feed them into the conversation. What does this mean for the issue? What does this say about our culture, our leadership our values etc?. What are our collective strengths? Where do we need to focus our attention? What are the next steps, timeframes, resource needs etc? To enable breakout sessions, I would propose to create Twitter hashtags for each group or table, and then use Tweetdeck as the twitter application to project on the screen. Dedicated Tweetdeck columns can be set up to filter by hashtag, and this will allow each breakout group to work within their own dedicated column. I think there should be at least two large screens so that nobody has their back to the Twitter stream. We will be writing more, especially as we are looking to use our Positive Matrix experience to brainstorm and design dedicated “Twitter Powered” conferencing and workshop software, filling the gap that Twitter currently has when compared to tools that can not only conduct workshops, but also introduce structured agendas and provide post workshop reporting capabilities. For anyone thinking that Facebook, and “Social Media” in general, is a phenomenon for younger people only, think again! Does anyone still believe this may be a male dominated and predominantly geeky space? Think again! Women over 55 are the largest growth statistic on Facebook, and Women outnumber men in every category. Now, I would love to have these statistics on Twitter! The number of US women over age 55 using Facebook grew by 175.3% since September 2008, making mature females one of the fastest growing demographic groups on the social network, according to usage statistics released by independent blog Inside Facebook. The number of men over age 55 also grew dramatically during the same four-month period (up 137.8%), but women over 55 still outnumber men in this age group by almost two-to-one. There are 45.3 million active US Facebook users. 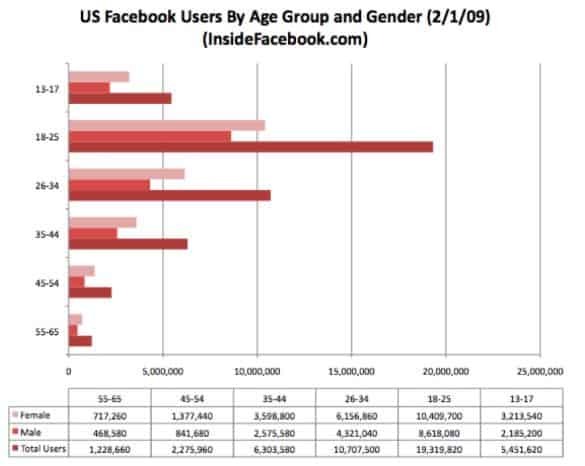 The number of Facebook users are growing in every age/gender demographic. Facebook use among women is growing faster than among men in nearly every age group. The fastest growing age group by total users is 26-34-year-olds; 45% of Facebook’s US audience is now 26 years old or older. 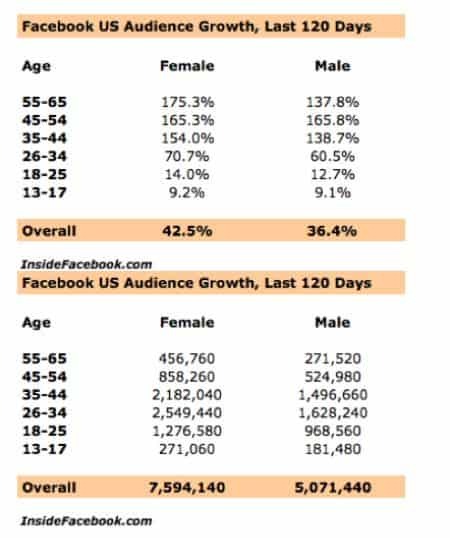 Facebook’s US audience has continued to grow in recent months, fueled primarily by those ages 26+, said Inside Facebook. In particular, the network has rapidly gained popularity in the US with people 45+, growing by more than 165% among both men and women in the last four months. Overall, women (56.2%) on Facebook in the US outnumber men in every age group. This number is up from 54.3% late last year.